After meeting in the earliest possible time at the tournament’s opening weekend, in which La Salle took care of the Lady Eagles in four sets: 25-14, 25-17, 16-25, 25-19, both teams went their separate ways. Going 4-3 in their next seven games dropped DLSU into a four-way tie for the second to fifth spots together with UST, UP, and FEU. After which, La Salle won their next three matches against NU, UST, and Adamson that enabled the team to gain some separation from the rest of the Final Four contenders. Meanwhile, Ateneo, despite going through a few tough five-setters, went unbeaten and zoomed all the way to the top at 10-1. As both teams try to extend their winning streaks and do their best not only to out-swag each other but also tally another win for their side of Smart Araneta Coliseum, here are eight things I like and don’t like heading into Saturday. In order to achieve a four-peat, La Salle must first qualify for the Final Four; something the team can clinch with a win on Saturday. The Lady Spikers are aiming for their 11th straight appearance, and also the 20th playoffs stint in 21 season for coach Ramil de Jesus. La Salle swept Adamson 25-15, 25-18, 25-16 during the first game last Sunday, April 7 while the Lady Eagles needed four sets to take care of the NU Lady Bulldogs in the following game. 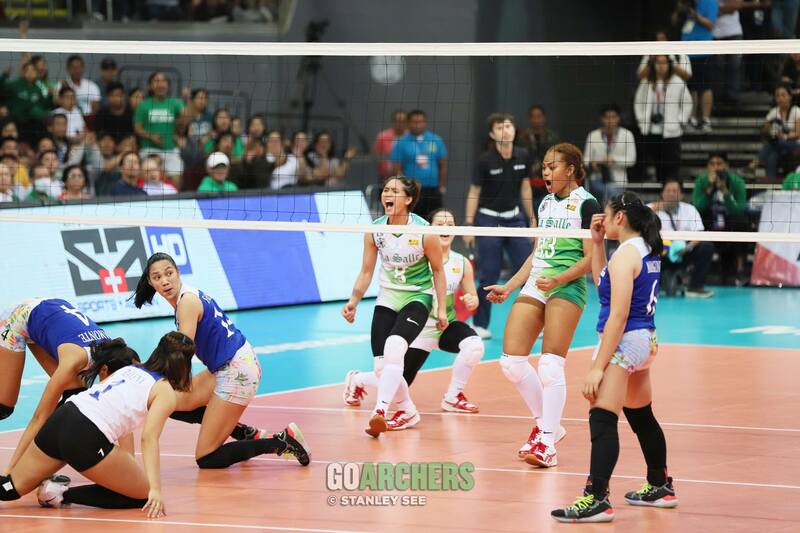 DLSU and AdMU are both coming into their showdown with exactly six days to rest and prepare. Which means there will be no excuses when the Lady Spikers sweep the regular season or if Ateneo ties the series at 1-1. Despite playing 11 games each at this point in the season, a further breakdown of won and loss sets indicate that Ateneo (31-11) has not only won more than La Salle (26-12), but has also played four more frames that their Taft Avenue-counterparts. Those four sets already equates to virtually one additional “game” that Lady Eagles have played this season. As the league’s number 1 (AdMU) and no. 2 (La Salle) teams in terms of blocking, expect to see plenty of rejections come April 13. Coming into the season, the Lady Spikers were actually forecasted not to utilize blocking as one of their main weapons due to their shorter line-up and those predications came through in the first game as Ateneo had the 8-4 edge in kill blocks. The slow adjustment of 6’1 middle blocker Des Clemente from the the style of play in the NCAA to the UAAP didn’t help improve La Salle’s blocking game either. Clemente would start the game, only for coach Ramil de Jesus to sub the former University of Perpetual Help standout in favor of Julia Ipac. But RdJ’s patience and perseverance on his middle blocker had been paying off as of late. After a combined eight points in her first five games, including zero points in her first two matches against Ateneo and Adamson, Clemente has been on a tear in the team’s last six game with a total of 43 points. With eleven UAAP games under her belt and having already experienced a La Salle-Ateneo match, here’s hoping the other “Des” would make a big impact and make her presence felt come Saturday. If there’s one indicator whether La Salle would win or not this season, it would have to be the number of unforced errors that they commit. In their three loses, DLSU committed more miscues that their opponents (37-29 vs. UP, 23-18 vs. UST, and 37-23 vs. UP), giving the opposite squad free points and preventing the Lady Spikers from gaining momentum. If DLSU can limit their errors below their average of 24/game against Ateneo, the results should bode well for the defending champions. Speaking of “Des”, the production and leadership of the OG one, team captain Desiree Cheng, on the court have been instrumental in La Salle’s three-game winning streak. The fifth-year open spiker needed a timeout to rest an ailing shoulder at the middle of the tournament and now looks to be close to 100% heading into La Salle-Ateneo part two. Displaying a full range of motion in her hitting arm, Cheng has been the leading point-getter for three of the past four games of La Salle. She even set and re-set her UAAP career high in a span of five days, scoring 17 against National U before re-establishing her points record with 20 against UST. With an ever-improving Clemente and a very consistent Aduke Ogunsanya manning the middle slots, it will be up to the solid play of team’s wings: Cheng, rookie Jolina dela Cruz, Tin Tiamzon, and May Luna to produce the points that La Salle will need for a season sweep of the Lady Eagles. Coming off a stellar sophomore year in Season 80, it is somewhat surprising that starting setter Michelle Cobb is having a “down” year by her standards. With Cobb sharing setting duties with rookie Marrione Alba in what coach RdJ calls as “change of tempo” strategy has decreased her excellent sets average per set down to 5.66 (4th among setters) from last year’s 8.26/set (second only to AdMU’s Deanna Wong’s 8.54/set). Her play and individual matchup against the opponent’s setter/s is another barometer for La Salle’s success or failure. Cobb outplayed Wong and rookie Jaja Maraguinot during the first meeting but lost the battle of the setters versus UP (21 excellent sets compared to Ayel Estrañero’s 38), UST (14 vs. 21 from rookie Mafe Galanza), and then again against UP where Alba took top setting honors with 12 of the team’s total 19. With a worse record coming into Saturday, La Salle is the proverbial underdog between the two teams. Even with a win against Ateneo, the Lady Spikers, realistically speaking, can only finish as no. 2 in the standings. The truth is, whether they finish the elimination rounds as the number one seed (Season 80) or no. 2 (Season 78 and 79, both to AdMU) doesn’t really matter, what is crucial is that they first clinch a Final Four spot, then secure a twice-to-beat advantage. And hopefully along they way, they gather enough momentum and poise to hoist the championship trophy for a fourth-straight time.